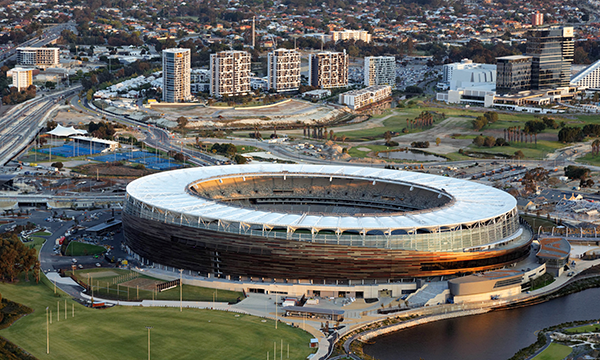 The Optus Stadium situated just east of Perth City on the Burswood Peninsula is a world class, multi-purpose event venue. Optus Stadium features 60,000 seats to host a multitude of sporting and entertainment events including AFL, cricket, soccer, rugby and big name concert events. The surrounding Stadium Park area includes public spaces, restaurants and recreational facilities along the Swan River. Event goers will be entitled to free public transit with their Optus Stadium event ticket on trains and buses. Choosing to park and ride to Optus Stadium from a CPP car park can be a fast and stress-free option. Optus Stadium features an easily accessible bus loop and a designated train station. Use the CPP mobile app or cityofperthparking.com.au to find directions from your current address to one of these suggested CPP car parks and walk across the scenic Matagarup Bridge to the Optus Stadium grounds. For more information on events at Optus Stadium, visit optusstadium.com.au.